Every time you click the New Worksheet button, you will get a brand new printable PDF worksheet on Subtraction. You can choose to include answers and step-by-step solutions. Unlimited adaptive online practice on Subtraction. Practice that feels like play! Get shields, trophies, certificates and scores. Master Subtraction as you play. 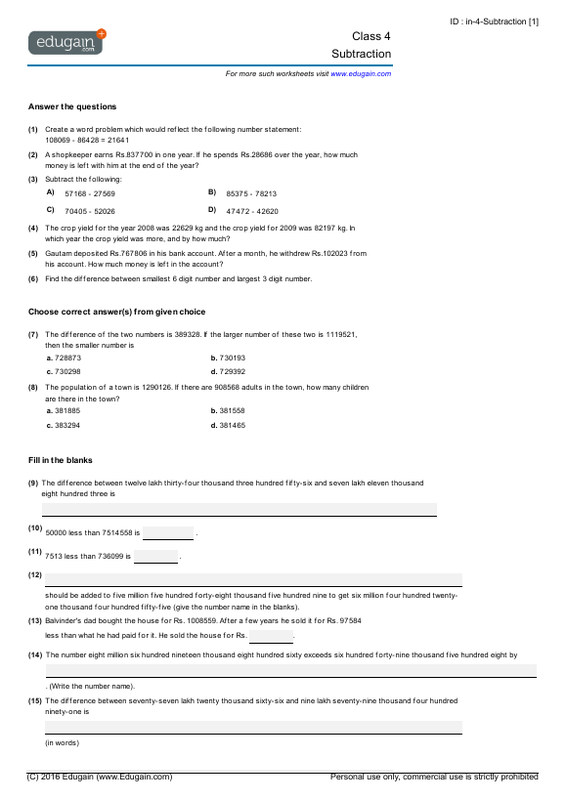 Take unlimited online tests on Subtraction. Get instant scores and step-by-step solutions on submission. Make sure you always get your answers right in Subtraction. Solve word problems on subtraction of numbers with 2 to 4 digits. Solve word problems on subtraction of numbers with more than 4 digits. Subtraction of large numbers, with more than 4 digits. Mixed operations involving subtraction and addition. Find missing digits while subtracting two numbers. Higher order thinking skills in subtraction.